Eastward view of Pahvant Butte along the turn-off from the Clear Lake Bird Refuge road. With a tremendous explosion a volcano primed with superheated steam erupts underwater, spewing enough volcanic ash and cinders high into the atmosphere to turn day into night. The ash covers the surrounding area like snow. Wind piles ash in drifts downwind of the volcano. Large waves race over the surface of the water and crash violently onto nearby shores. Flying birds drop dead from breathing sulfur and ash. Is this a “Geofantasy” scenario, perhaps? Actually, this scenario is compiled from accounts of many worldwide historical eruptions including the 1963 Surtsey eruption that created a new island near Iceland. And perhaps this scenario was the story of the creation of Utah’s Pahvant Butte. About 15,500 years ago, in a place that is now known as the Black Rock Desert in west-central Utah, a volcano explosively erupted from the bottom of the rising Ice Age Lake Bonneville. Pahvant Butte (also known as Pavant Butte or Sugarloaf) ejected shreds of basalt lava high into the air that quickly cooled into glassy particles the size of sand (volcanic ash) and gravel (volcanic cinders) collectively known as tuff. The explosion produced a crater on the south face of Pahvant Butte. During the eruption the wind must have been blowing to the northeast; black volcanic ash from the eruption is found in sand dunes northeast of Pahvant Butte. When the eruption ceased, a volcanic cone called a tuff cone was left to the mercy of erosion by Lake Bonneville. The rising Lake Bonneville was only 50 feet (15 m) below its highest level, the Bonneville level, when the eruption occurred. The highest point on Pahvant Butte was at least 435 feet (130 m) above the water at the time. Waves carved a shelf around most of the volcano except for the north face where intense storm waves cut a vertical cliff into the cone. The cut exposes an intricate lacey pattern caused by the partial cementing of the tuff by minerals in ground water. The cliff is known as the “Lace Curtain” because of its white color and mysterious lacey pattern. Ground water also altered the tuff above the Bonneville-level beach into a yellow-brown glassy substance called palagonite. Pahvant Butte has white, partially cemented tuff at the Lace Curtain, unaltered black tuff below the Bonneville-level beach, and altered yellow-brown tuff above the Bonneville beach. When Lake Bonneville breached its threshold at the Bonneville level about 14,000 years ago, the lake quickly dropped to its second-highest level, the Provo level. The Provo-level beach is evident near the elevation of the 30,000 to 128,000 year-old basalt flows that make up the base of Pahvant Butte. Today, the highest point on Pahvant Butte is 5,486 feet (1,670 m) above sea level. The entire volcano is about 740 feet (225 m) above the ground surface and 2 miles (3 km) in diameter. The Black Rock Desert has been an active volcanic area for the past 2.7 million years. The youngest basalt lava flow (600 years old) and one of the youngest rhyolite lava flows (400,000 years old) in Utah are found in the Black Rock Desert. 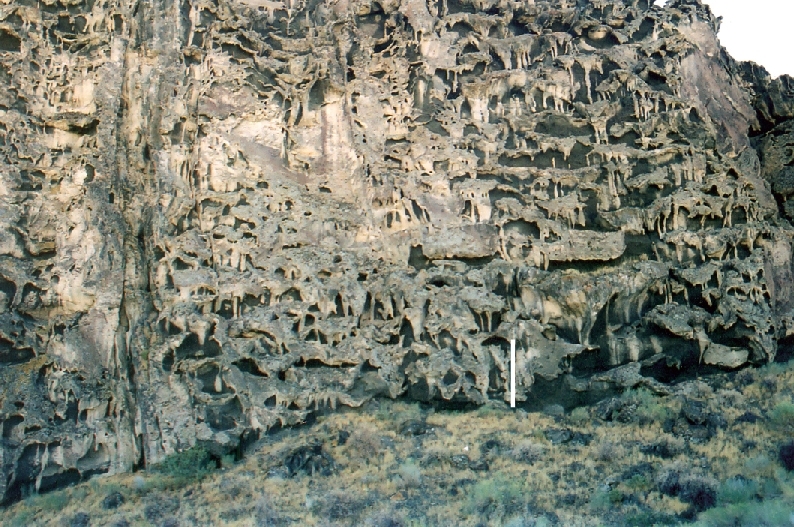 Faults provide the pathways to the surface for lava as well as ground water in the Black Rock Desert. The nearby Clear Lake Bird Refuge has a series of spring-fed ponds along a major fault. How to get there: From Delta, take Highway 6/50 west to the intersection with Route 257 that leads to Deseret and Milford. Go south on Route 257 for 21 miles (34 km) and turn left (east) on the road to Clear Lake Bird Refuge. Drive eastward 7.5 miles (12 km) on the well-graded dirt road to the sign to Pahvant Butte. Pahvant Butte is easily visible, even from Delta.